It’s time to add some sound files to my website! I’m a maker much more than a player, so please forgive me for not playing better. In this video I effort to demonstrate the tonal characteristics of my flutes using my phone to record. Please, listen beyond the mistakes and the moderate sound quality to hear the flute. I will get sound files of better players playing my flutes at some point, but for now I have my phone and myself with a YouTube account! 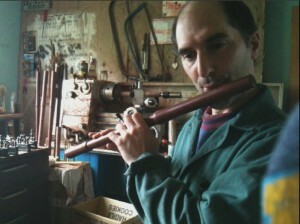 This entry was posted in Videos and Recordings and tagged australian flute maker, Australian flute makers, australian hardwoods, buy wooden flute, Celtic flutes, cooktown ironwood, d flutes, flute, flute maker, flute makers, flutes, flutes for Irish music, hoza flutes, Irish style flutes, keyless d flutes, keyless wooden flutes, Mark Hoza, red ebony, wood flute head, wood head joints, wood headjoints, wooden flute, wooden flute maker, wooden flutes, woodenflute, woodenflutemaker, woodenflutes. Bookmark the permalink.